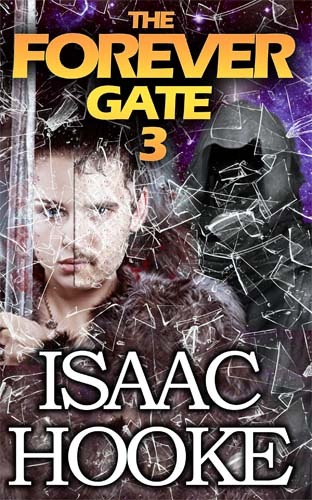 Cover Reveal: THE FOREVER GATE 3 By Isaac Hooke | Isaac Hooke. Here’s a sneak peek at the cover of The Forever Gate 3, which will be released on Kindle very soon. Blurb and excerpts coming shortly. Sign-up to my blog under the “Get Updates via Email” section and I’ll let you know when it’s out! This looks really good! I love how much drama the cover conveys. After looking closely I noticed that the person’s head appears to be half women and half man. Definitely lots of drama. What makes this cover very cool is that you can just make out a dark, cloaked figure behind the main characters — clearly the Great One ominously portrayed as acting behind the scenes. The dichotomy between the main characters could be a metaphor for the split between the realities of the Inside and the Outside. The shattering glass could signify a break in the realities, or a break in the bridge between realities, as mirrors are used in the books as an “aid” to cross those realities.